Easy cabinet makeovers you can do on a dime. These are great for the kitchen or the bath. Learn more from our friends at Better Homes and Gardens. When you make home improvements, you want to maximize your financial return in the future while enjoying those improvements in your home today. Some home improvement dollars stretch more than others so when you are on a limited budget it’s important to spend those dollars wisely. One way you can do this is by adding molding to a room or throughout your home. it is one of the most dramatic ways to dress up a room and has been around since ancient times. Crown molding and chair railing are both still sought-out decorative features that buyers search for when looking to purchase a new home. Today’s moldings come in hundreds of options from wood to foam and from simple to ornate. You can stain it, paint it, or leave it natural. Some molding these days even include lighting. 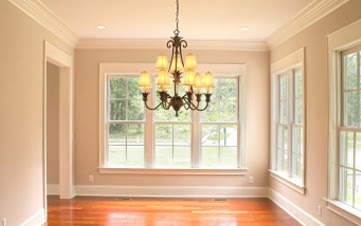 *Use crown molding to make a room seem bigger and taller. But be careful about proportions. If your ceiling height is 9 feet or less, go with simpler styles to avoid overwhelming the room. *Chair railing placed incorrectly can make a room seem out of proportion. Rule of thumb: Place chair railing at one-third the distance of the ceiling height. *Don’t forget entryways, doors, and windows: Bump up the trim around these areas to give rooms a completed and expensive feel. Call your local ANDY OnCall® to get your job started today! Looking for a weekend project? Paint a vanity for a simple – yet bold – bathroom refresh! Learn more from our friends at Lowe’s. Finding storage space in an open floor plan can be somewhat of a challenge. 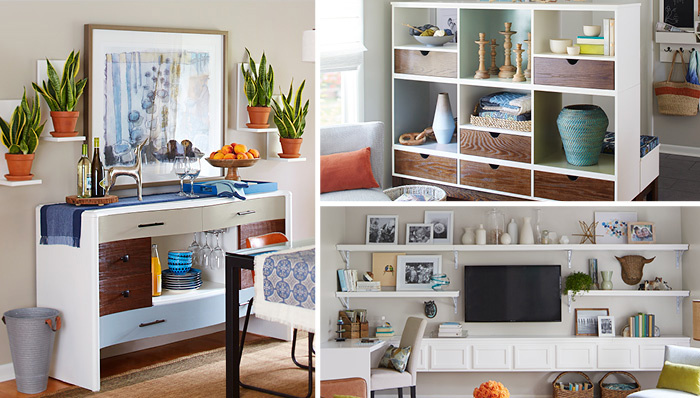 Check out these ideas from our friends at Lowe’s. Spend your time and money wisely with the #1 low-cost home improvement project for immediate ROI. Learn more from our friends at HouseLogic. Are you looking for ways to make improvements to your home without spending a lot of money? Check out these simple kitchen and bathroom improvements that will make your life easier. Learn more from our friends at The Family Handyman.